Purebred Dog breeds that begin with "V"
Those are lovely dogs. The white one looks like my dog Bunny who I had when I was young. 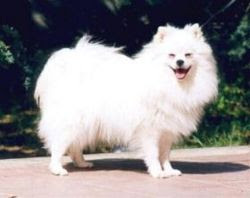 Bunny was a Japanese Spitz. I'll come back again to read your other posts. Hmmm, that Volpino Italiano looks amazingly like an American Eskimo, lol. Great looking dogs. I noticed in your sidebar the blinkie about fibromyalgia hurts and I am one who also has this horrible disease and I just got over a bad week with it. I can totally feel for you. I have suffered with it for 15 years. I love that cute little white one!! Have a wonderful Tuesday my friend! As a dog lover, I love your originality with this HorT!!! Interesting take on V this week. Thanks for stopping by my Heads or Tails and commenting!!! 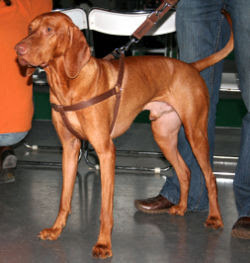 That Vizsla is one big dog, but cute as heck. Thanks for visiting. Oooh! What a great idea for V! I had not heard of any of those. Although one looks a lot like a miniature American Eskimo. Those might be similar? My in-laws have one. She's sweet...but kind of a snob (smile). I stayed with vote...and got carried away....sigh. I like that bull dog. That's a neat post; I didn't know most of those breeds.